I love making jams at home. You get to control the amount of sugar and also avoid the addition of "hard to pronounce" ingredients in it. I never knew making jams can be so easy! Our jams are always homemade and I make them with various seasonal fruits available. Some of our favorites include the Pomegranate jam, Plum Jam and Orange Marmalade giving a variety to our morning breakfasts! I had a huge bag of cranberries lying around in my freezer since December. After making some crumbles and muffins with fresh cranberries, I had frozen the remaining pack. When clearing out my freezer, I knew I had to finish those cranberries before they start dying! I had some fresh grapefruits in hand and quick Google Search gave some jam results with grapefruit and cranberry! And hence this healthy jam was born!! Who can deny a breakfast with a jam packed with Vitamin C, fiber and antioxidants. The cranberry gives a nice color to the jam and it reminded me of the mixed fruit kissan jam back in India. Carefully peel the grapefruit and take separate the flesh from the grapefruit reserving any juice. If you would like to make a marmalade instead of a jam, you could also add about 3 tablespoons of the grapefruit rind. Combine the grapefruit sections and water in a large saucepan and bring to a boil. Reduce heat to medium, and simmer 15 minutes, stirring occasionally. Add cranberries, and cook 10 minutes. Stir in sugar and cook for 30 more minutes or until slightly thickened, stirring occasionally. Remove from heat and allow to cool 10 min. Do not worry, if the jam does not have jelly consistency. Cranberry has pectin and will set in the next 24 hours when poured into a glass bottle and allowed to set. Pour into jars or airtight containers. Allow to sit at room temperature for a few hours. Store in refrigerator for up to 3 weeks or in a freezer for upto 6 months. Last month, I was contacted by the fine folk at POM wonderful, wondering if I would be interested in sampling POM. I immediately agreed since we are huge fans of POM and it is a must in our shopping list during our trips to Costco. They sent me eight cute little bottles. We drank several of them and I reserved a few of them to try out some recipes. I made this spiced tea cake from the POM website and it tasted delicious with tea without any frosting. I also believe it might taste great with a simple cream cheese frosting. POM is an amazing source of antioxidant without any compromise on taste. If you dont have access to POM, you could extract juice from the pomegranates and sieve out the seeds and use it in this recipe. In a mixer, cream together sugar, shortening and eggs (batter should be slightly lumpy). Add pomegranate juice and milk; beat for 2 minutes. Sift together flour, cinnamon, baking powder, nutmeg, cloves and salt. Add flour mixture to the creamed sugar and shortening mixture. Mix to combine. Bake 50 to 60 minutes or until cake tester inserted into cake comes out clean and free of crumbs. Did you know that you could make jam with Pomegranate? Check this out!! This is a classic and easy salad with a very simple dressing made at home. Made with simple and delicious ingredients and makes summer/spring scream in your mouth with all fresh ingredients. This can be accompanied with any meal and gives a great start to your meal. To make the dressing, combine all the ingredients together and whisk away until well combined. You can add fresh herbs to the dressing if you like. I just wanted to keep it simple. Slice the olives and cucumber into thin slices. In a bowl, assemble a bed of lettuce and top it with cherry tomatoes, olives, cucumbers and sprinkle the goat cheese on top. Drizzle the dressing on top and toss. Chill the salad by wrapping the bowl with a plastic wrap and leaving in the fridge for about half an hour. Enjoy you healthy delicious salad. Everyone is pretty excited about Valentine's Day! Even though we don't celebrate Valentine's Day as such, I make it a point to cook something cute and romantic just to make the day memorable. Here are a few such recipes which are easy to make, look pretty and appealing! Valentine's Day is all about hearts and these little heart shaped cookies take you back to your childhood where "little heart" biscuits where a treat to munch on! Sorry, the picture doesn't do any justice to the recipe. This picture was taken long back when i had zero photography skills :( These taste really delicious with that hint of lemon! Gulab Jamuns are our all time favorite! And the picture talks for itself. Who can ignore these luscious gulab jamuns! No one would like slaving around the stove cooking an elaborate meal or dessert. This two-minute coffee cake sure gives a quick fix to your coffee and dessert cravings in just under two minutes!! Yes two minutes! Go dig in! 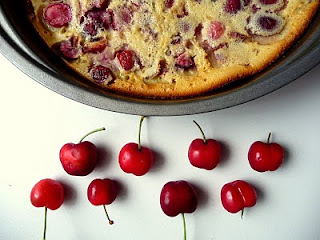 These clafoutis sure look romantic with all those cherries in there! Do check them out. Makes a great dessert after a sumptious meal! Coconut and sugar cannot go wrong! This pretty looking sweet coconut puffs looks exotic and makes a tasty snack along with your evening tea! These blueberry muffins are delicious just by themselves or slathered with some butter! Give your other half some goodness with these blueberry muffins! Chocolate and nuts in the form of cookies can never go wrong. these cute little cookies can be made in the shape of hearts and these would definitely woo your other half! Moving on to some savory dishes, these cheese stuffed jalapenos make a great appetizer for any meal! These soft pretzels resemble hearts and they are cute to be rejected by anyone! 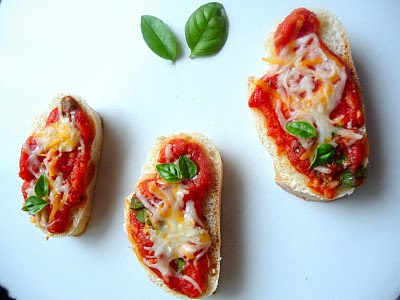 These italian bruschettas look pretty dressed up with the tomato sauce, cheese and a basil leaf. They look so gourmet! This is one healthy fingerfood with all the goodness of asparagus!! This has always been a hit at my place. It is an indianized version made with curried potatoes and other veggies. What are you cooking for your Valentine? 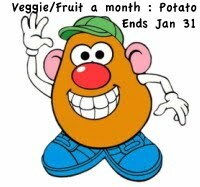 Here I am with the roundup of Veggie/Fruit of the Month Potato. Thanks Priya for giving me the opportunity to host this lovely event. 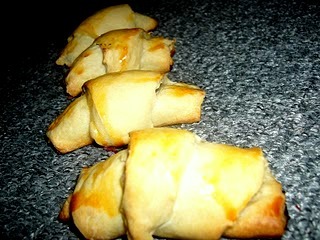 Also, I extend my thanks to my fellow bloggers for sending in their delicious entries. I have categorized the entries into sweets, appetizers, side dishes and main dishes. Hope you enjoy them! I stumbled upon this recipe a while ago and had bookmarked it to try. Recently, I have switched to a low-carb diet in order to lose some weight and this looked like a great soup to have for lunch. TH enjoyed it along with rice and a vegetable stir-fry. I adapted the recipe and cooked the dal in an indian way using the pressure cooker. It is a great way to sneak in broccoli and make kids eat their share of veggies. The end result was a bright green and yellow colored with a hint of garam masala. Makes a hearty lunch all by itself or along with some rice or rotis. Wash the broccoli florets and pulse them in a mixer into a coarse mixture. In a pressure cooker, heat the oil and add the cumin seeds. Add chopped onions and saute till they turn translucent. Add the dal and saute for a minute followed by the coarse ground broccoli. Add about 3 cups of water and pressure cook until you get 3-4 whistles. Open the pressure cooker and mash the dal well with the back of a ladle. Add the turmeric powder, garam masala and lemon juice. Switch on the stove and bring the dal to a boil. Simmer until desired consistency is obtained. Stir in the lemon juice and garnish with tomatoes and coriander leaves. Serve warm along with rice, roti or by itself as a soup. This is my entry to Show Me Your Soup event hosted here at Dil Se..
Chettinad cuisine is one of the spiciest and the most aromatic in India. Chettinad cuisine is famous for its use of a variety of spices. The dishes are hot and pungent with fresh ground masalas. They also use a variety of sun dried meats and salted vegetables, reflecting the dry environment of the region. This chettinad thakkali kuzhambu is one such curry made with ripe tomatoes with a hint of coconut. In a kadai/saucepan, add one spoon of oil and add all the ingredients to be ground. Saute on medium heat. Take care it doesn't burn. Grind it into a coarse paste. Blanch the tomatoes and remove the skin. You could do this using a microwave. Chop the onions lengthwise. Slit the green chillies vertically. In a saucepan, add the remaining oil and saute the onions, green chillies and curry leaves until the onions turn translucent. Add the ground masala and fry for about two minutes until the raw flavor goes away. Add the blanched and peeled tomatoes. Cook for two more minutes until the tomatoes get well cooked. Add the tamarind extract, salt and jaggary if using and bring it to a boil. Simmer for about 5 minutes until it reaches the required consistency. Garnish with coriander leaves and serve hot with idlies or dosas.